The different anticoagulant drugs used both in the treatment and prevention of deep venous thrombosis can cause several adverse effects. The most significant complication is bleeding. In Advances in Health and Disease. Volume 6, the authors begin by examining how to choose the most appropriate drug for decreasing the risk of bleeding, taking into account the characteristics of each of these drugs as well as those of the patient. The authors go on to discuss infectious mononucleosis, also known as kissing disease, which is characterized by the classic triad of fever, pharyngitis, and cervical lymphadenopathy, where lymhocytosis and atypical lymphocytes are also present. The classic test for infectious mononucleosis is the demonstration of heterophile antibodies. Monospot test, a qualitative test using the latex agglutination technique, is the most widely used method to detect the serum heterophile antibodies of infectious mononucleosis. 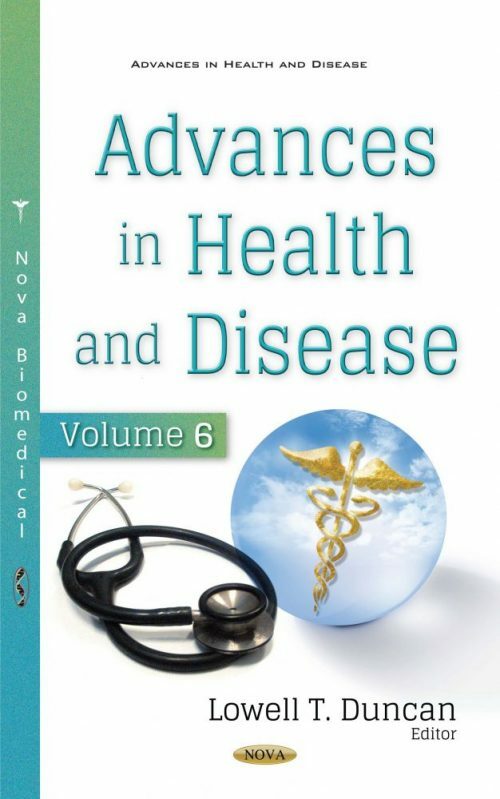 Next, this collection presents the current knowledge on pro- and anticoagulation mechanisms in kidney diseases, as well as the authors’ experiences in the treatment of both conditions in different clinical subsets: glomerular, tubulo-interstitial and genetic renal diseases, in infectious diseases and illicit substance abuse with renal involvement and in some immunological inflammatory diseases with renal involvement. Later, the authors propose that epigallocatechin-3-gallate (EGCG), a catechin found in green tea, can prevent vascular endothelial cell injury and dysfunction. EGCG has an antioxidant effect in vascular endothelial cells and induces nitric oxide (NO) production by promoting endothelial NO synthase expression. The effects of EGCG might help to prevent arteriosclerosis in its early stages. However, detailed mechanisms of the preventive action of EGCG and its molecular targets on endothelial dysfunction remain elusive. Thus, this review explores the results of studies that investigated the effects of EGCG from green tea on the prevention of vascular endothelial dysfunction during the early stages of arteriosclerosis. This compilation also examines the Human Immunodeficiency Virus (HIV), which has become a stumbling stone in the progress of human civilization. With congruence to whole world, Bangladesh has also been experiencing the epidemic since mid-1980. This collection provides a review regarding the prevalence of routine surveillance among the population considered “at risk” for HIV infection, as well as the national policy to prevent the HIV epidemic in Bangladesh. In a subsequent review, the authors examine streptozotocin (STZ), a compound that was originally identified in the late 1950s as an antibiotic, and currently is widely used to induce experimental diabetes mellitus. Although STZ has been used in research, there has been no standardization of a well-established protocol. It’s important to highlight that STZ has non-specific toxicity, which can contribute to variability in its outcomes. This assessment aims to determine the influence of different protocols of induction of diabetes mellitus with STZ on the effectiveness of the method and possible side effects of this compound. This book also analyzes 57 relevant papers on the issue of nerve palsy after total hip replacement, and aims to review the pathophysiological data, prevalence, etiology, risk factors, prognosis and prevention of this complication. Nerve palsy after total hip replacement is a rare complication (0.08% to 7.6%). An especially relevant public health problem in South America and Africa is that of Yellow Fever (YF). A YF outbreak occurred in areas in close proximity to major urban centers of Brazil where YF vaccine was not routinely administered. In view of this, several YF mass vaccination campaigns were performed including these locations. Therefore, the authors review the pertinent information regarding the completion of the YF mass vaccination campaigns in 2017 and 2018 in Brazil. Future perspectives for this vaccination in the national territory are also discussed. The authors present current, normative data on a new examination method of endothelial dysfunction (ED) in childhood. The reversibility of ED is an attractive primary target in the effort to decrease cardiovascular risk in pediatric patients and to optimize therapeutic strategies. Thus, early detection of ED may have therapeutic and prognostic implications. To evaluate endothelial dysfunction, especially in children with chronic diseases, a combination of plethysmographic reactive hyperemia index (RHI) and specific biomarkers was used- plasma concentrations of assymetric dimethylarginine (ADMA), high-sensitive C-reactive protein (hsCRP), E-selectine and vasoadhesive molecules (VCAM) in comparison with healthy controls.